I love my Livescribe SmartPen. I use it all the time to take notes at meetings and keep myself organized. I love how it also records audio and keeps it in sync with your handwritten notes and can sync over WiFi to my Evernote account. 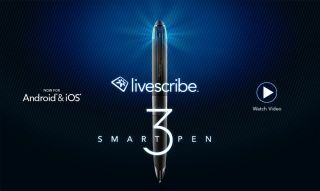 Livescribe released the Livescribe 3 last year with an iOS app that let you sync directly to your iPhone (and into Evernote and OneNote). It also allows searching handwriting, converting handwriting to digital text and more. "Your Livescribe 3 pairs with Livescribe+ to instantly sync everything you write on paper directly onto your iPhone or iPad. Your notes become more useful when they are organized, tagged, searchable and converted to text." Finally, they are releasing an Android app, which they state has been designed from the ground up for the Android platform. This is great news for Android users. The Livescribe pens allow people who like to take notes on paper to do so, but have a digital copy of their work to share, store and recall whenever needed.